Looking at your holiday shopping list and scratching your head? Well, perhaps you should take a little inspiration from this midcentury catalog, presenting “America’s newest ideas in gifts.” Note the word choice is newest—they make no promises beyond novelty. Unfortunately, it’s hard to assign an exact year to this wacky beauty. A little research reveals that Hanover House was quite a catalog powerhouse in the 1980s, for instance, and made it far enough into the new millennium to get onto the internet. 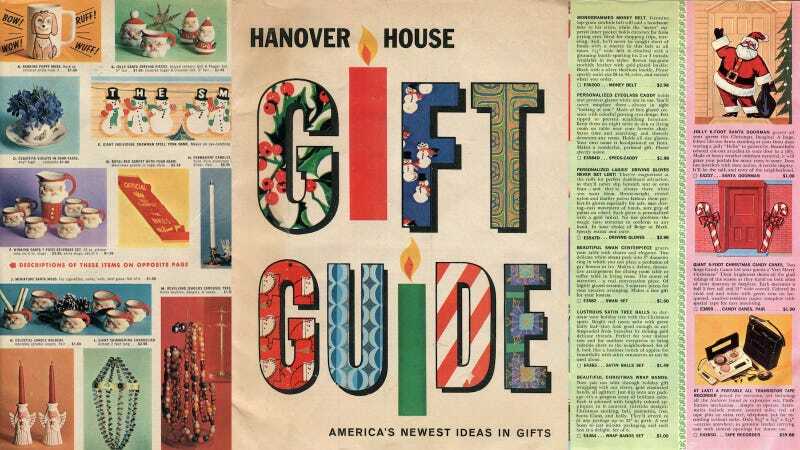 According to a glowing June 1999 writeup in the trade publication Multichannel Merchant naming it one of the “10 BEST Catalog Concepts Ever,” the Hanover House brand was launched in 1962 as a general merchandising spinoff from the Lana Lobell dress line and quickly took off. So presumably we’re looking at something that is technically from the 1960s, but still a product of the cultural era we call “the Fifties.” How can we know this for sure? All the product listings featuring very well-dressed women doing housework. Eat your heart out, Donna Reed. Of course it’s very important to maintain all your permed, arched-eyebrow perfection, and the humming consumer economy is more than happy to assist. Enlarge to appreciate in all its wacky glory. This is a face you can trust for hair-removal tips. As a perfectly groomed product of the postwar era, you will of course want to shower your baby boom offspring with toys. (Much like they will be showered with New Deal and Great Society era social programs, which they will eventually do their absolute damnedest to dismantle for their descendants.) Hanover House has you covered! Look how cute. The nightmares are minimal—pinkie swear. Just don’t forget to keep them safe, as well. And of course you’ll want to place an order for a couple of items for your hubby, as well. Here’s your chance for a little good-natured dig at his unwillingness to bother to remember your birthday. Just remember—if you want to buy any of this stuff on credit, you’ll have to get your husband to sign your application for credit. Yes, the man who is apparently incapable of remembering important dates. Happy hunting, ladies!